Urban Decay 24×7 glide-on eye pencils.. 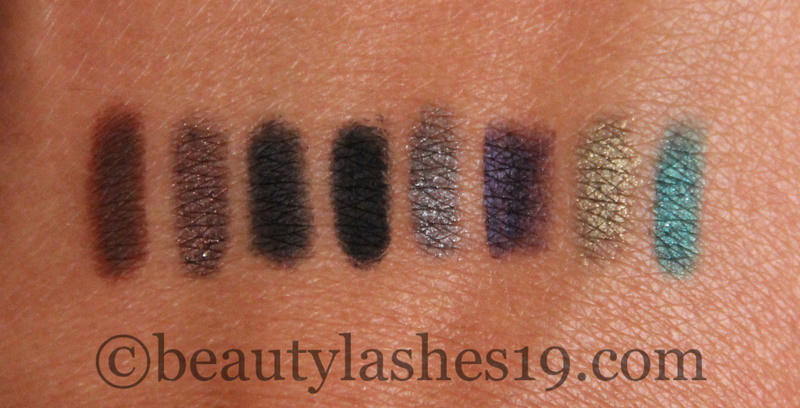 So, I decided to start the week off by reviewing the Urban Decay 24×7 glide-on eye pencils.. These come in single or double ended forms.. The single eye pencil retails for $19.00 USD each while the double ended pencil costs $16.00 USD each.. The color range (over 40 shades!) & pigmentation on these is great.. You can see the colors I have in the swatches below.. These pencils go on smooth & are meant to be waterproof with long-lasting power.. I have tried using them as an eye liner (against my top lashline) and also on my waterline.. Although they last all day on my lashline, these do not stay put on my waterline.. Towards noon or evening, I see the pencil running onto my lower lashline and fading away from the waterline, which is not a look I am going for.. So, I predominantly use these only on my lashline.. One quality that’s good about these pencils is that upon application, these pencils give you a window of about 20-30 seconds to smudge/blend the liner before it sets to a long lasting finish.. This is great for creating a smokey eye or a soft liner effect..